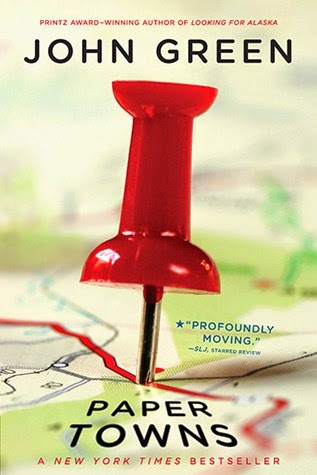 Besides The Fault in our Stars, Paper Towns is the next book of Green’s that reads more like a movie script. And it looks like there is a future film in the works. Quentin “Q” Jacobsen is a high school student in Orlando, Florida. He is pretty much unknown and ignored, except for the occasional bullying from Chuck, other than that time he and Margo Roth Spiegelman, his neighbor and school mate, found a dead guy in the park when they were nine. Robert Joyner committed suicide out of the depression of his recent divorce. Since then, Margo and Quentin haven’t had much of a relationship as Margo runs in different, higher social circles. Randomly, Margo shows up at Q’s window in the middle of a school night and convinces him to help her get revenge on her cheating boyfriend Jase, Becca, the girl with whom he cheated, her boyfriend’s friend and bully Chuck, and her friend Lacey whom she feels betrayed by for possibly knowing and not telling her as well as constantly undermining her weight. Q has a major scholarship to Duke and doesn’t want to get involved with anything that could jeopardize his future, but Margo’s intense power of Q forces him to leave behind his innocence and go on this adventure with her. For Jase and Becca, Q calls Becca’s father to tell him that Jase and Becca are in the basement together. When her father rushes downstairs, Jase escapes through the window in only his boxers. Q snaps a quick picture of him, forever capturing a part of Jase he doesn’t want the world to see. Q and Margo leave and go to Becca’s next where Margo spray paints an “M” in Becca’s house and leaves a dead fish, not subtly suggesting that their friendship is over. Next, they quickly stop at Karin’s, who is the girl who told Margo that Jase was cheating, and there they leave a bouquet of flowers. From there, they go to Jase’s house, spray paint another “M” and leave another dead fish. Margo’s last stop on the revenge train is at Lacey’s house. There they spray paint yet another “M” and leave a dead fish in Lacey’s car. After making the run through Margo’s list, she takes Q to the top of the SunTrust building where she shows him what Orlando looks like to her—paper towns. She describes the town and the people as fake and expresses her intense desire to leave. She asks Q on whom he would like to enact revenge, and after some hesitation, he chooses Chuck Parson, the guy who has bullied him over the years. They sneak into his house, put Vaseline on all of the doors to make it harder to chase them when they run out, and Q takes off one of Chuck’s eyebrows with some Veet. Chuck awakes, startled, and screams for his mother like a little girl. Q and Margo escape just in time. For the last part of the night, Margo convinces Q to break into SeaWorld, and after Margo is bitten by a garter snake in the moat and they make it into the building, they realize that all of the animals are somewhere else, and the trip was a disappointment. They go home, go their separate ways, and Q believes that the next day at school will be different, that Margo will give up hanging out with her fake friends and join him. When Q arrives at school the next day, Margo doesn’t show up, nor the day after that. Q becomes worried that something has happened to her, even though Margo has done this a few times before, and she always leaves clues. Q’s friends, Ben and Radar, are also concerned, probably more for Q’s sanity than Margo’s disappearance. Here is where the book changes course and leads into an entirely new direction. After three days of being missing, Margo’s (well let’s just say it, negligent) parents finally file a report. The cop who is assigned to the case explores Margo’s room and pulls the shade down on her window. It is then that Q notices that Margo has taped up a Woody Guthrie poster onto the shade. He realizes that Margo has left clues for him to find her! Q, Ben, and Radar sneak into Margo’s room and connect the poster to a poem by Walt Whitman. As an English teacher, this is where my interest piqued. Finally, an author who knows how to allude to American literature! Margo has highlighted sections of the poem, and Q believes that it is a code for him to figure out. One particular highlighted part discusses taking a door off of its jambs, and after becoming frustrated that he can’t figure out what she means, he takes his own door off the hinges and finds a note from Margo with an address that leads him to an abandoned mini-mall. There, Q, Ben, and Radar realize that she’s been hiding there, collecting travel guides and maps of possible places she could have run to. Q, Ben, and Radar access Radar’s website, Omnictionary, and find a list of “pseudovisions,” or undeveloped subdivisions where she could be hiding. For the remainder of the book, they follow any possible clue they think Margo left in order to find her, even on their graduation day. Without spoilers, I enjoyed most the references to Whitman, Dickinson, and Plath and how cleverly Green is able to weave some of the most famous American authors into the mysterious disappearance of Margo Roth Spiegelman. Paper Towns is a smart novel with intelligent characters who are all going to prestigious colleges, and the bread crumb trail that Margo leaves behind is the perfect incentive to have one last journey before going their separate ways. While I was disappointed with the ending, which I won’t divulge here, I enjoyed trying to figure out the clues alongside the characters. Again, this was another Green novel with a big realization at the end for the protagonist and one that I can respect, though I felt like some of my time was wasted in getting there.